Tempers flared at the Costa Rica National Motorbike Championship - costing Jorge Martinez and Marion Calvo two year suspensions! Costa Rica's National Motorbike Championship does not usually attract the attention of worldwide audiences. 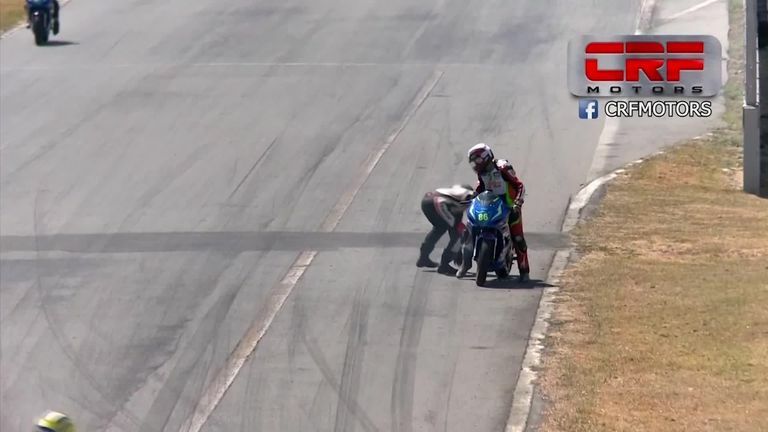 But that is set to change after a pair of riders were handed two-year suspensions following an extraordinary on-track clash. The bike eventually came to a halt - and Martinez was furious when he clambered off, resulting in fisticuffs on the track as other riders zoomed past. Understandably, the Latin American branch of the International Motorcycling Federation have ditched out hefty punishments. Click on the video above to watch the chaos unfold!